I decided to do something a bit different on the blog today and give myself a budget challenge! After finding aaaaalll the things at the Nordstrom sale, my husband and I decided together that my clothing budget seriously needed a reset. Plus, I felt like it was important to share that you don't need to spend lots of money to find a whole new outfit full of versatile pieces! We had so much fun looking out for the best deals, and I was really pleased that we were able to find FIVE super great pieces that I know I'll get a ton of wear time out of this summer and into fall! I still can't believe we scored this whole outfit for under $100! 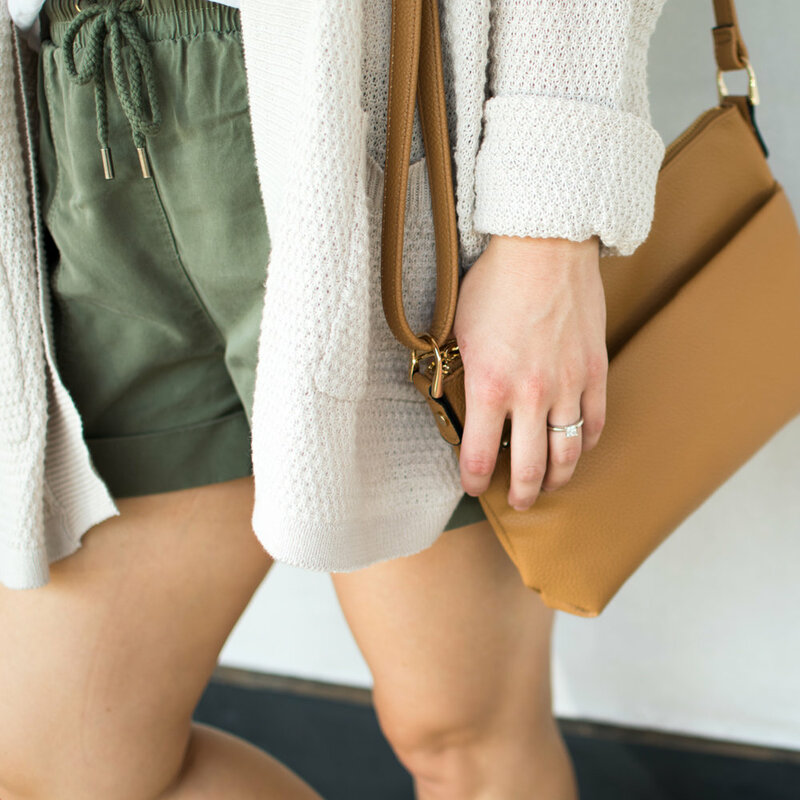 I have been looking for a pair of utility shorts like these all summer- they are so comfy and easy to throw on! They run a little big- I'm wearing an XS. I'm also wearing XS in the white button-up top, and I love the fit! This will get so.much.wear.time. in every season! The cardigan I chose is super lightweight and comes in several other color options, and the slides (maybe my favorite part) were only $13!! I'm really impressed with the quality for the price! I sized up a half size in the shoes. The bag was the one thing I went back and forth on several times, but I ended up loving the size and color of this one! It's perfect to transition into fall. Check out the video below for a re-cap of the whole experience, and you can CLICK HERE to subscribe to my YouTube Channel! I'll be uploading lots of fun, budget-friendly shopping hauls in the coming months!